The Simplicity footplate and seat swivel are manually operated. The Simplicity comes with a clip seat belt as standard. The Simplicity Series track offers a continuous charge function meaning that the lift can be parked on any part of the track when it is not in use. This means you do not need to worry about where you leave your lift on the track as the batteries will charge in any position. The Simplicity can have a Manual hinge or a Slide Track if required. For those requiring powered options, the Simplicity+ is a stylish solution to overcome the challenges of climbing straight stairs. It combines the continuous charge track of the Simplicity with the seat of the Minivator 1000 which means it is available in a selection of six colours. 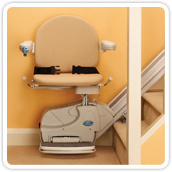 The Simplicity+ offers the choice of manual or powered folding footplate and swivel options. The Simplicity+ is compatible with the powered Slide Track or manual hinge system so if you have a doorway close to the bottom of your stairs the Simplicity+ offers you a choice of solutions to prevent the track from causing an obstruction. 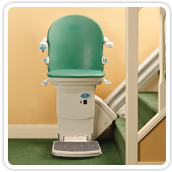 For those looking for minimal track intrusion into the staircase, the Minivator 1000 offers one of the slimmest straight stairlift tracks on the market. 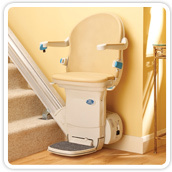 Available in a choice of six upholstery colours, it can be supplied with optional powered features to fold the footplate and to swivel the seat at the top of the staircase to allow for ease of exit. The slim line aluminium track has a hidden rack which offers two park points (as standard) which charge the batteries at the top and bottom of the stairs. The Minivator 1000 boasts our heaviest weight capacity at 160kg/25st. The Minivator 1000 can be combined with a powered hinge solution to prevent the track from obscuring any doorway at the base of the stairs. It isnt only stairs inside the home that cause problems for some people. Steps up to a porch or front door can be equally difficult to climb. 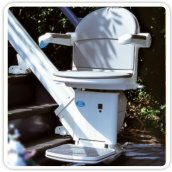 The Minivator 1000 Outdoor stairlift is fully waterproofed and designed to overcome the problems caused by external straight runs of stairs. Like all Minivator stairlifts the outdoor model has a key switch to prevent unauthorised use of the lift, which means it can be isolated when not in use. 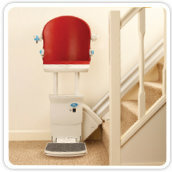 Supplied with UV protected Slate Grey upholstery the Minivator Outdoor stairlift also comes with a waterproof cover to keep it protected from the weather so it is always ready for use.